The execution of Jan Hus 6 July 1415. “What error should I renounce, when I know myself guilty of none? For as for those things which are falsely alleged against me, I know that I never did so much as once think them, much less preach them. For this was the principal end and purpose of my doctrine, that I might teach all men penance and remission of sins, according to the verity of the gospel of Jesus Christ, and the exposition of the holy doctors : wherefore, with a cheerful mind and courage, I am here ready to suffer death.” When he had spoken these words, they left him, and shaking hands together, departed. Martin Luther`s coat of arms was a swan. Hus began to sing with a loud voice: “Jesus Christ ! the Son of the living God! have mercy upon me.” And when he began to say the same the third time, the wind drove the flame so upon his face, that it choked him. Yet notwithstanding he moved awhile after, by the space that a man might almost say three times the Lord’s Prayer. 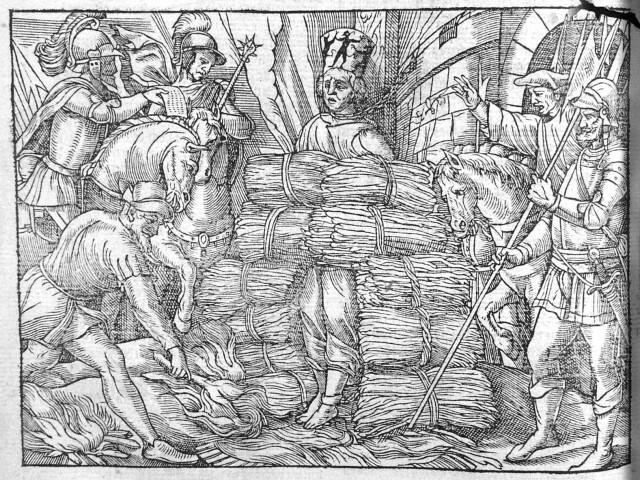 When all the wood was burned and consumed, the upper part of the body was left hanging in the chain, which they threw down stake and all, and making a new fire, burned it, the head being first cut in small gobbets, that it might the sooner he consumed unto ashes. The heart, which was found amongst the bowels, being well beaten with staves and clubs, was at last pricked upon a sharp stick, and roasted at a fire apart until it was consumed. Then, with great diligence gathering the ashes together, they cast them into the river Rhine, that the least remnant of the ashes of that man should not he left upon the earth, whose memory, notwithstanding, cannot be abolished out of the minds of the godly, neither by fire, neither by water, neither by any kind of torment. Return to the English Reformation, introduction.